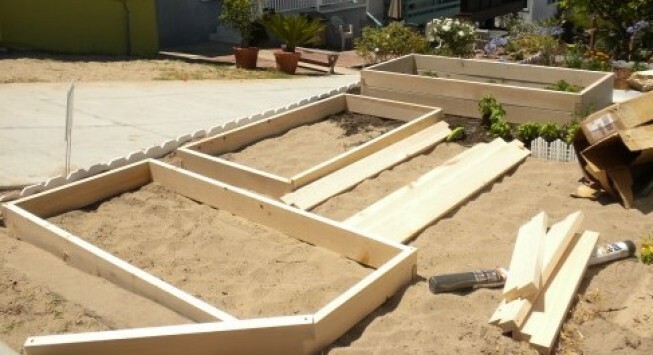 How do I build a raised bed? 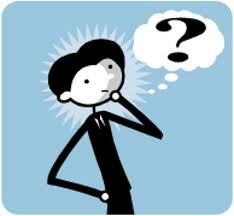 This is such a common question that I decided to dedicate an installment of my GroEdibles blog to this subject so that you can refer back to it as needed. Growing plants in raised beds is a logical choice for gardeners with heavy, poorly drained soils. 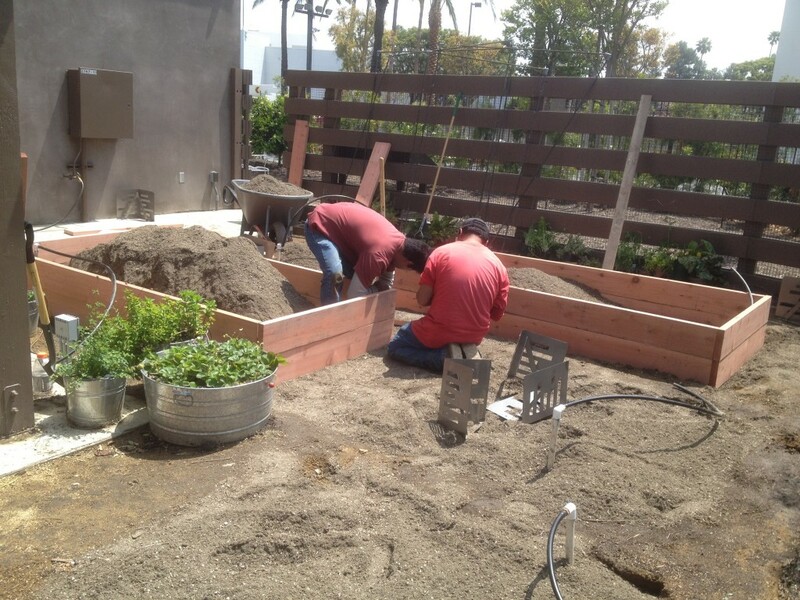 Raised beds permit plant roots to develop in soil held above water-logged or compacted zones. This provides a more optimum soil environment for root growth. As beds are built up, compost or other forms of organic matter may be incorporated, further improving soil structure, drainage and nutrient-holding capacity. Better root growth from improved soils leads to higher yields for food crops and lusher growth of ornamental plantings. 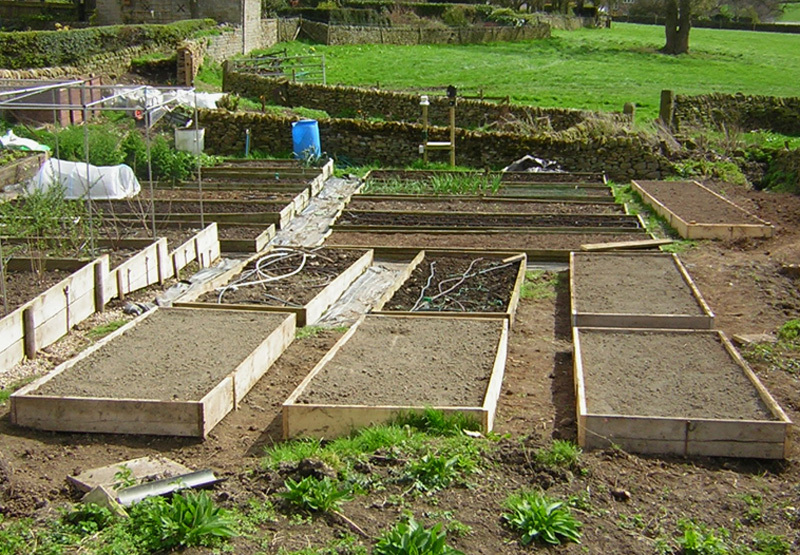 Also, intensive planting in raised beds means more plants can be grown in a smaller area than with conventional row-cropping techniques. No space is wasted between rows. Better drainage speeds soil warming and allows earlier spring planting. In wet seasons, soil dries out faster, permitting planting to proceed between rains. Because plants are growing above the level of foot paths, less stooping is required for weeding, watering and other chores. Intensively planted raised beds (the strategy I prefer) provide dense foliage cover, shading out much weed growth. 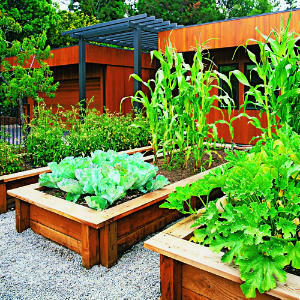 Raised beds make gardening possible on sites where growing plants would otherwise be impossible or very challenging. 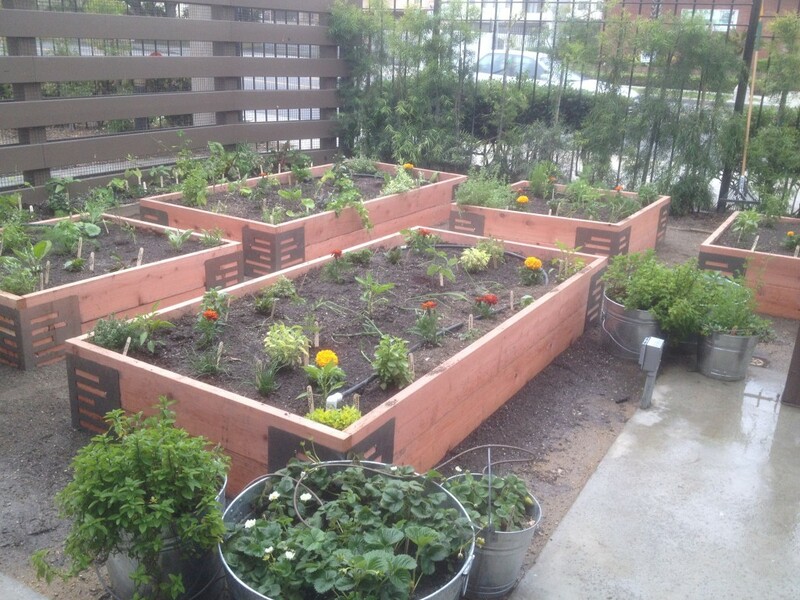 Rooftop gardens, gardens on slopes and raised beds on top of solid rock are examples. Terraced raised beds turn hillsides into productive growing areas while reducing soil erosion potential. While I will let the links I’ve “harvested” 🙂 from the internet give you the specific instructions, I want to mention a few key elements that my years of using raised beds have proven to be essential ingredients for success. 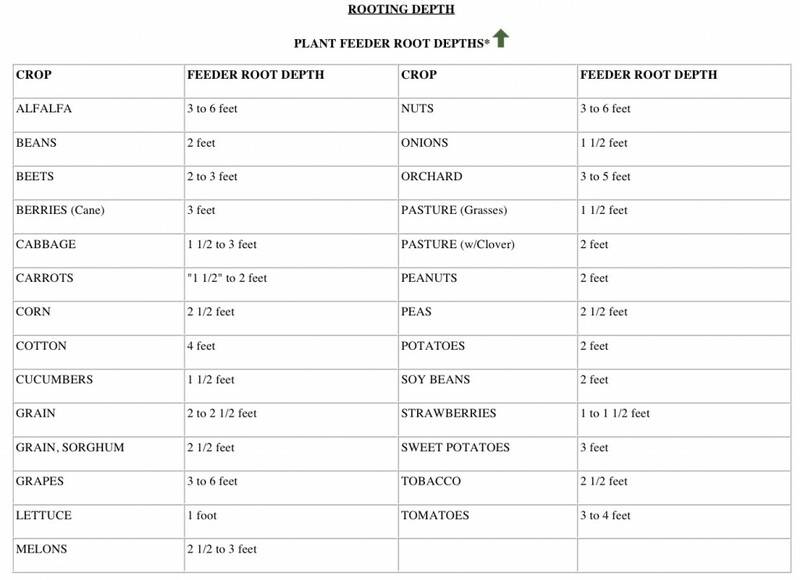 1) ROOTING DEPTH = DEPTH OF RAISED BED: As important as this is to know when you’re planting into the ground, it’s even more important when you’re growing in raised beds and containers as well. My recommendation: IF YOUR NATIVE SOIL IMMEDIATELY BELOW your raised bed site is unworkable or otherwise impaired, make sure you build your beds deep enough to allow you to grow the widest range of vege possible…16-24″ AND establish and maintain a healthy soil food web. 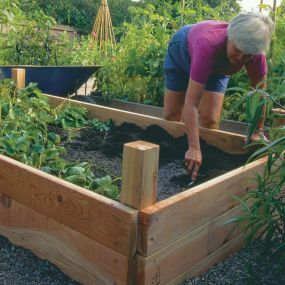 2) RAISED BED WIDTH: For ease of use and to make sure you don’t have to walk on your soil causing compaction, make the beds a width that allows all the gardeners tending the beds to access the middle of the beds comfortably…that usually means an interior width of about 3′ (4′ total width). 3) MATERIALS: There are many options here. I’ve used redwood, cedar, broken concrete and cement ash block. All of these work well and, of course, if you re-purpose or reuse any of these materials – EVEN BETTER! DO NOT USE PRESSURE TREATED LUMBER. Even though there have been changes in the pressure treatment process, I still won’t use it and, therefore, can not recommend it to you. As always, this is up to the individual gardener to decide. Do your own research. I’m sure you’ll come to the same conclusion. After all, you’ve gone to all this trouble to keep your food source as pristine as possible, why risk chemicals leaching into your soil from your building materials? http://www.hort.purdue.edu/ext/treatedlumber.html The cedar and redwood (even unsealed) will last a good 5-10 yrs (depending on site/usage) which is a very acceptable life span. 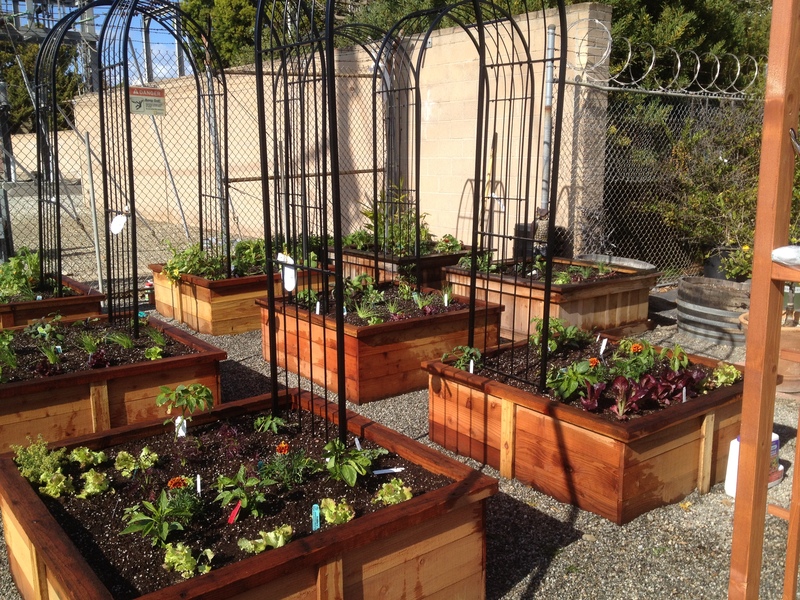 Check out the HGEL Fan Photos as some fans have posted great pics of the raised beds they’ve built. Of course as simple as these are to build some of you may be interested in buying kits. I’ve included a couple of links for you in the link list below. Using raw linseed oil as a wood preserver is acceptable way to extend the life of your boxes and is allowed in certified organic gardening. 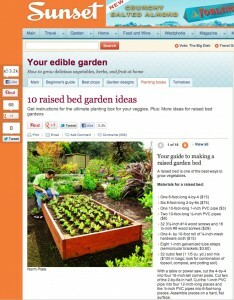 4) PEST CONTROL: Whatever materials you use to construct your beds, take care to add one important element to the bottom of your beds: heavy gauge hardware cloth or small opening, heavy gauge gopher wire (http://www.groworganic.com/gopher-wire-4-x-100-roll.html). Believe me, this extra step will save you much grief! 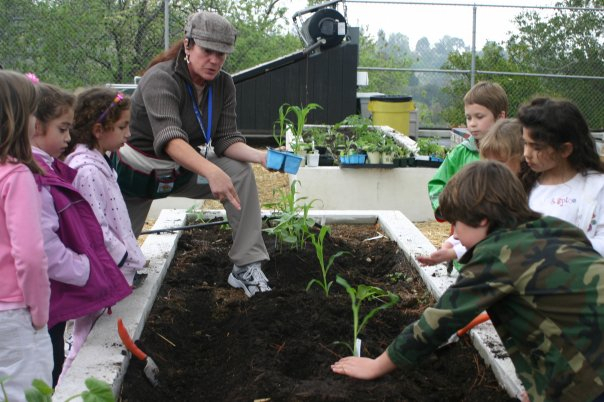 This barrier method is the ONLY thing that stopped gopher invasion in my school garden beds! This will have to be replaced about every 5-6 yrs or so as those buggers will eventually work their way through as the barrier degrades. 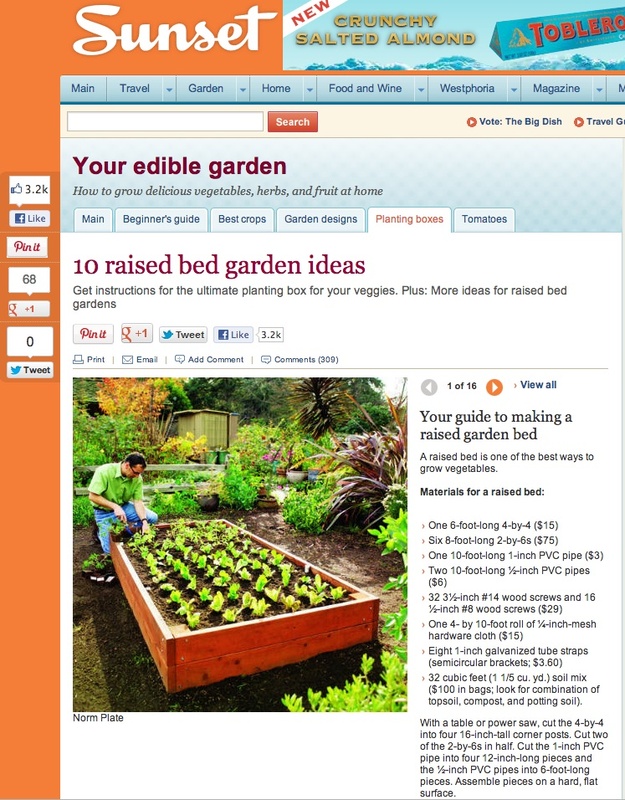 Also, as you are designing your beds, consider adding a mechanism to support a hoop house around your bed. One of the “Garden Girl” videos below shows you how she does this. I’ve also see pieces of pvc pipe attached to the outside of the beds so that pvc pipe can be slipped into them easily to form the hoop structure. Use your imagination. Hoop houses are essential in pest protection and growing season extension. That’s basically it! Enjoy the links below….post your questions AND, most importantly… ; POST YOUR PICTURES OF YOUR FINISHED RAISED BEDS ON THE HGEL FAN PAGE! Art of the Garden – M Brace: http://www.artofthegarden.net/ (Mbrace corner brackets featured in Martha Stewart Living March 2011 issue) The M Brace will be sold in our GroEdible store that will be opening soon. How to build an MBrace raised bed from Art of the Garden on Vimeo. Cement block beds in school garden. 5×15′ (exterior measurements) These beds are 10 yrs old now. 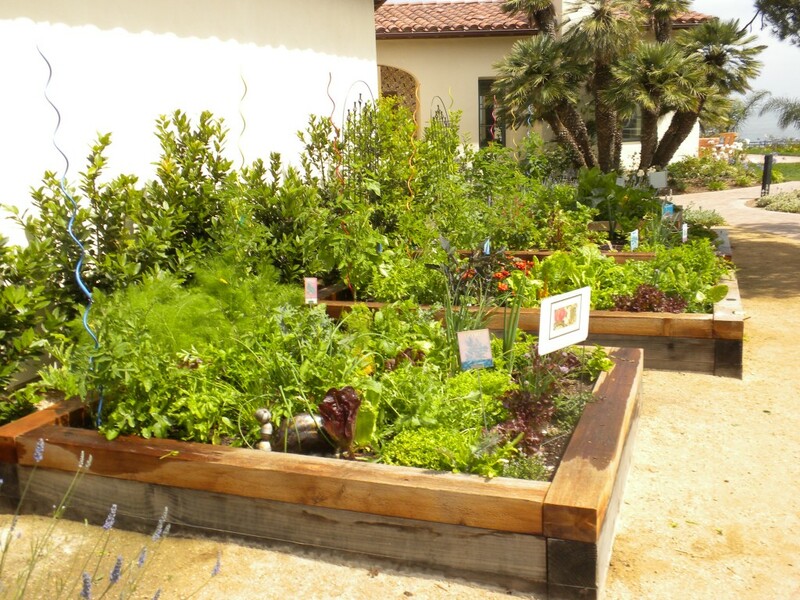 Raised beds at mar’sel restaurant garden, Terranea Resort. Made w/ 6×6″ & 4×6″ cedar timbers. Geri – great article and illustrations!!!! I saw your both at the Orange county fair and liked the metal corners you used for making “raised beds” I heard someone say that they were for sale, but didn’t think about buying some until after I had left. Do you have them available on your website to purchase? I have looked a little, but haven’t found them yet. I will keep looking at your website, maybe I missed them. I will have them available in November from my online store which you can find on this website. In the meantime, visit artofthegarden.net. You can order them directly there. The link is in the body of this blog article along with a video on how to use them. Very great post. I just stumbled upon your blog and wished to mention that I’ve really loved surfing around your blog posts. In any case I’ll be subscribing to your rss feed and I’m hoping you write again very soon! On the pressure treated lumber non recommendation. Well I know alittle something about chemistry and leachability and after my review, I DO NOT reach the same conclusion. The newer wood offers only copper as a potential leaching concern. Since most of US home water pipes are ….. Wait for it….copper emerged in water (the leaching mechanism). Arsenic was the concern with the old lumber treating process and even that as a leaching prob was probaly a stretch except on the sites where large amounts were used, spilled and often remained on that site. 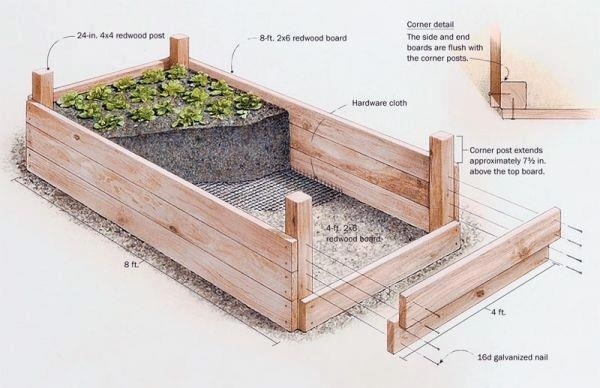 I will be making my new raised beds from newly treated boards and will have more concerns from ozone and carbon dioxide in the air than from anything leaching from my beds. Just my opinion but I feel it is an informed one. Thank you for your thoughtful comment. I really appreciate you taking the time to share your experience. I teach organic practice so can only recommend gardening strategies that are approved for organic practice which eliminates using treated lumber. Additionally, I cannot recommend something that I wouldn’t myself use or expose my own family to. As I state in the blog, there have been changes in the chemicals used. These are my own recommendations and I urge folks to do their own research. The final choice remains with the individual gardener. Would paint be a bad idea? 1. Hopefully your boxes were made with 2″ thick boards. This will help be certain that there is no risk of seeping through to interior of box. 3. ONLY paint the outside of the box taking care not to over apply to risk the paint coming into contact with the soil.